Silver amalgam fillings offer strength and durability at lower cost, but many people don’t like the look of them. 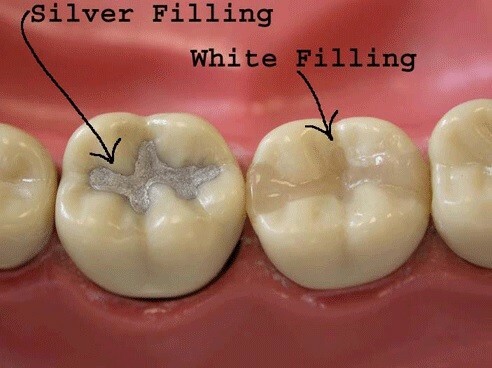 Also, amalgam fillings can be more prone to expansion and contraction and thus they are more likely to cause a tooth to crack compared with other filling materials. Fillings made of a tooth-colored composite are popular because the color can be matched to your teeth. Composite fillings are not as durable as metal fillings and they may need to be replaced after five years, compared with 10 or 15 years for metal fillings. They are more expensive than amalgam fillings. These glass and acrylic fillings usually last less than five years, but they are often a good choice for children whose teeth are still changing. Also, they can release fluoride, which can help prevent tooth decay.